This post was published on 26 January 2012. It was one of two posts on Maria Chapdelaine. These earned me an invitation, by Montreal’s Writer’s Chapel Trust, to the unveiling of a plaque honouring Louis Hémon. Unexpected events prevented me from attending, but I am thankful for the invitation and regret not attending. See Related Post: Regionalism in Québec Fiction: Maria Chapdelaine. This is the first post I wrote on Maria Chapdelaine. I went on to write a second one. French author Louis Hémon (12 October 1880 – 8 July 1913) moved to Canada in 1911. By then he had already published several books. As for his Maria Chapdelaine, he wrote it during the winter of 1912-1913, sent his manuscript to France and started travelling west. Hémon died in a train accident at Chapleau, Ontario. Had he travelled a little further he would have met the descendants of voyageurs, Métis, and aristocrats referred to as “The French Counts.”[ii] They had settled in the Assiniboia region: Count Henri de Soras, the Marquis de Jumilhac, Viscount Joseph de Langle, Count de Beaulincourt and others. Louis Hémon came to Quebec during a period of its history when there was very little work for French-speaking Canadians inhabiting Quebec and Acadia. This period of Canadian history is called the Exode. Nearly a million French Canadians and Acadians moved to the United States where they could work in factories. This could not be the Church’s best choice. One priest, the famed Curé Labelle (24 November 1833 – 4 January 1891), was the chief proponent of colonisation. He urged French-Canadians to settle north and “make land,” faire de la terre, faire du pays, as their ancestors had done. This was their mission. So making land had been Samuel Chapdelaine’s choice. He had taken his family to the Lac Saint-Jean area where he and his sons were turning inhospitable land into arable soil. I should think Hémon named Samuel Chapdelaine after Samuel de Champlain, whom we could call the founder of New France. 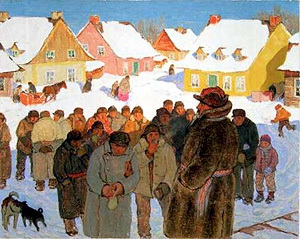 When Louis Hémon arrived in Canada, 1910, he lived in Montreal. But two years later he travelled north and stopped at Peribonka, in the Lac Saint-Jean area. At first, he worked as a farmhand, helping “settlers,” but, as noted above, he spent the winter of 1912-1913 writing Maria Chapdelaine. Hémon had sent his manuscript to France but he never savored the success of his novel. It was serialized in France in 1914 and published by J. A. Lefebvre in Quebec in 1916, with black and white illustrations by Marc-Aurèle de Foy Suzor-Coté. It was an international bestseller. An English translation, by W. H. Blake, was published in 1921. There is a summary of Maria Chapdelaine (just click on the title) on the website of the McMichael Canadian Art Collection, housed in Kleinburg, a village just north of Toronto. 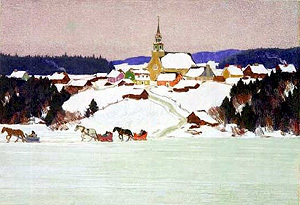 Clarence Gagnon‘s (8 November 1881 – 5 January 1942) 1933 illustrations of Maria Chapdelaine are part of the McMichael Canadian Art Collection. However, I will summarize the summary. Maria is the daughter of a “settler.” She is a little plump, but beautiful. One Sunday, the day on which parishioners get together and chat, Maria meets François Paradis. François is a sort of coureur des bois, voyageur, canoeman, lumberjack: the mythic fearless pioneer. When François meets Maria, he is attracted to her and tells her that he will stop by her family’s farm before escorting Belgian travelers who are looking for fur. Maria and François fall in love. They will be married when he returns from the logging camp. However, he dies in a blinding snowstorm attempting to visit with Maria on New Year’s Eve. Maria has two other suitors: Eutrope Gagnon, a settler and neighbour, and Lorenzo Surprenant, who has travelled from the United States to find a bride. What Lorenzo has to offer is an easier life: no black flies, no back-breaking labour, milder weather, nearness to a Church and to stores. She is genuinely tempted to marry him, despite the fact that she is not in love with him. For Maria, love died the day François died. The names are all symbolic: Paradis for paradise; Surprenant; for surprising or amazing; and Gagnon for winning. My summary of Maria Chapdelaine may have diminished Maria’s suitors. But Hémon makes them very real and anxious to live their lives, which means taking a wife. Although it is a simple novel, finding a more focused, but somewhat stylized, account of life as it was in 1912 would be difficult. Maria Chapdelaine can be read online. It is a Gutenberg Project e-book. [i] “Louis Hémon.” Encyclopædia Britannica. Encyclopædia Britannica Online. Encyclopædia Britannica Inc., 2014. Web. 13 Jan. 2014. <http://www.britannica.com/EBchecked/topic/261010/Louis-Hemon>. [ii] Ruth Humphrys, “Dr Rudolph Meyer and the French Nobility of Assiniboia,” The Beaver (The Hudson’s Bay Company: Outfit 309:1, Summer 1978), p. 16-23. [iii] Maurice Poteet (ed. ), Textes de l’Exode (Montréal: Guérin Litérature, coll. 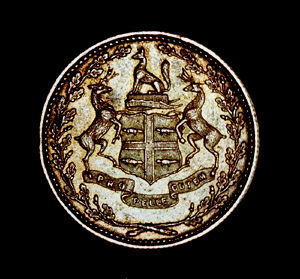 Francophonie, 1987).